Skierzz73 - Virginia Excellent decals "These numbers went on with ease and appea to be quite durable.... very sticky." JBLou - Louisville KY Good Numbers! 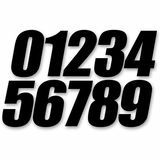 "I needed some smaller numbers for my front windscreen. The 4" size worked perfectly."